Indian Contemporary Designer Purvi Doshi, the connoisseur of textiles and handlooms will be showcasing her new line ‘Co existence’ in Lucknow on 14thand 15th November 2018 at FICCI flo to be held at Indhira Gandhi Pratishthan, Gomti Nagar, Lucknow. This two-day exhibition is a platform for the women artisans, craft persons and designers from across the country and abroad to showcase their talent to the consumers of the state of Uttar Pradesh. It will be open on both the days from 11 AM to 7 PM. Purvi Doshi’s latest collection was created to show the love and care for other living beings on this earth. Man has been the most superior animal and he has proven that by taking away the jungles and the water from the other animals. As they say “with great strength comes great responsibility” and co-existence showcases the many species of animals and birds like playful panda beautiful flamingos, towering giraffes, gigantic elephants and graceful birds in this gentle earthly collection. Ahmedabad based Designer Purvi Doshi has coupled the art of India with the handwoven fabric of freedom. Khadi, an indigenous fabric of India, forms the structure of each garment in this collection. The ensembles are dyed with natural colours that respect the environment we live in. 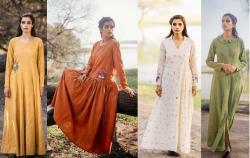 “Purvi Doshi” – the label celebrates India’s crafts and weaves by combining traditional techniques with contemporary designs moulded into beautiful nature friendly and eco fabulous clothing. It chronicles and restores heirloom traditions from the heart of our villages and fashions them into contemporary tales. The label collaborates closely with artisans and helping then create better livelihood.